Many researchers and educators believe that understanding mathematical equivalence — whether two expressions or quantities are equal — is essential for developing children’s algebraic thinking. Common Core State Standards for Mathematics call out equivalence as a key topic for mastery in early elementary grades. Mastery of equivalence in second grade predicts third grade math achievement and later algebra learning relies on understanding the meaning behind the equal sign. Many students fail to develop these understandings in elementary school and are at a disadvantage for mathematics learning in later grades. Traditional instruction promotes misconceptions of the equal sign for many early elementary students. Students may perceive the equal sign as a signal to “do something” rather than an indication that two sides of an equation are equivalent. Students that fail to develop a correct understanding of the equal sign are more likely to struggle in later math. WestEd is partnering with Nicole McNeil, a professor and cognitive development researcher at Notre Dame University, to bring research-based training and instructional materials to schools across the country. The materials were developed with funding from two prior Institute of Education Sciences (IES) Goal 2 Grants (Principal Investigator McNeil) and are designed to address key topics in the Common Core State Standards for Mathematics at the elementary school level. WestEd’s Improving Children’s Understanding of Equivalence (ICUE) Efficacy Study is supported by a four-year Goal 3 Grant from the U.S. Department of Education’s Institute of Education Sciences. The ICUE intervention is aimed at second-grade students. Second grade is a critical time for intervention, as early, targeted efforts may prevent misconceptions from forming. ICUE is structured as a 16-week intervention. Materials are used in the classroom for 15 minutes twice each week and feature independent workbook activities, small group activities, and classroom demonstrations. Prior research suggests the ICUE intervention greatly improves student understanding of mathematical equivalence. The current efficacy study investigates whether the sizeable effects found in smaller studies are found in a large-scale randomized controlled trial comparing the ICUE intervention to a 16-week active control program designed around non-traditional math practice. If ICUE leads to the predicted improvements in student outcomes, the materials will provide a practical solution to help students construct a robust understanding of one of the “Big Ideas” in math. The study will lay the groundwork for future research, testing the assumption that improving elementary students’ understanding of math equivalence has long-term positive consequences for mathematics achievement and algebra readiness. Watch this short video describing the Improving Children’s Understanding of Equivalence study. 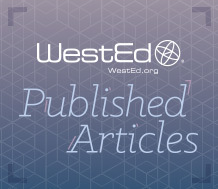 WestEd's Jodi Davenport coauthors an article in the Journal of Learning Analytics.